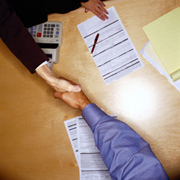 Accounting for your needs in today's business climate. Call NOW For a FREE Consulting Appointment!!! "Our experience is the key to your success!" ✓ Call or contact us online to setup an initial consultation. We will review your existing business structure and discuss the needs of you and your staff to ensure we meet your goals in a timely and efficient manner. ✓ We offer Quickbooks training and support both onsite and remote. Please call our offices to discuss current rates and available DISCOUNTS for packaged options. 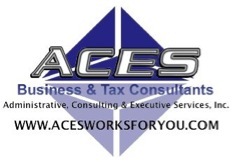 ACES provides full-service tax preparation services for indiviuals, businesses, partnerships, and trusts. We offer very competitive pricing and usually meet or beat the competition in both price and quality of service! You can't beat the best! We will organize and compile your financial tax data from your personal and/or business records to assist you in meeting IRS guidelines for record-keeping and audit purposes. First year tax clients receive the option to have our knowledgable staff review (at no charge) upto two years' prior returns to assure that all of the allowable credits and deductions were taken. Approximately 85% of the returns we review had "missing" credits or deductions...this means taxpayers OVER PAID their taxes! We will amend prior year's returns at our client's request at a discount from current year fees for new and existing customers. Call now for 2012 Tax Planning & Setup. December clients receive a DISCOUNT of $25.00 per return!! !